The Criminal Law Journal (ISSN: 0314-1160) features in-depth articles and reviews of criminal issues across all Australian jurisdictions. Consideration is given to law reform issues, comments on High Court and State criminal cases, comments on relevant legislation, a digest of recent criminal cases, book reviews and reports of developments in criminal law in Australia and overseas. The distinguished Editorial Board is led by the Hon Michael Kirby AC CMG and includes members of the judiciary, the Commonwealth Director of Public Prosecutions and leading academics. Featured regularly in the Criminal Law Journal are special themed issues which provide in-depth treatment of important areas such as sentencing law. 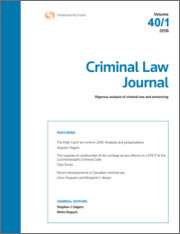 A quality research tool, the Criminal Law Journal provides peer-reviewed and rigorously researched commentary which is relevant, current and of high quality. Stephen Odgers SC is a Sydney Barrister who specialises in criminal law. He is the author of the highly successful and well-regarded Thomson Reuters publication Uniform Evidence Law which is available both as a book and as a paper and online subscription service. Professor Mirko Bagaric is a Professor of Law at Swinburne University Law School and a well-known writer and commentator on criminal law, sentencing, punishment, evidence and international law. He is Title Editor of “Criminal Law Principles” for The Laws of Australia.